In honor of Tranquil Space’s 18th birthday, THIS Saturday we’re hosting a TranquiliT trunk show at the Dupont studio (1632 17th, nw) from 10-1. Swing by for cake and homemade vegan pumpkin scones by moi, sit fireside, sip tea, and save 20% off TranquiliT. I’ll be there with our former boutique manager/TranquiliT-lover Patricia to answer any questions, show the many ways to wear the pieces, and help you get set for the holidays. TranquiliT is great for travel (see former packing post) and transitions easily from the yoga mat to the airport to cocktail parties. It’s all about ease and layers! For example, I used to have a summer and winter wardrobe where I would rotate heavy sweaters for sleeveless tops. Now I live in layers of TranquiliT year-round and have a small section in the back of my closet for my seasonal faux fur and faux leather jackets. No more rotating needed since nothing else is season-dependent. More below. 2in1 flare top in noir over tights. Wear as a mini dress or over leggings or skinny jeans. Turtleneck in aubergine with pencil skirt in noir. Add tights and a blazer for the office or faux leather jacket for a night out. Swing tunic in cafe. Top with cozy organic fleece infinity cowl and vegan boots. Sleeveless wrap dress in peacock paired with tights, turtleneck, and boots. Cape in au naturel organic fleece paired with 2in1 fitted top, leggings, and boots. Cardiwrap in heather paired with 2in1 chemise, leggings, and boots. 2in1 fitted top paired with our mesh skirt. Perfect for holiday! Year-round I keep arm warmers in my bag since I’m sensitive to overly air-conditioned environments. In fall and winter, I keep arm warmers and a knit beanie in my bag and am seldom without a scarf around my neck. Our fleece scarf is so cozy, and comforting—it feels like a security blanket. 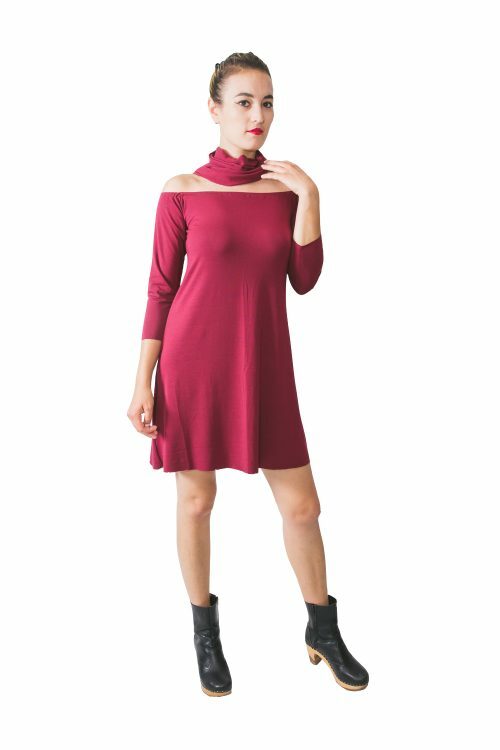 Off-the-shoulder dress in wine paired with a skinny scarf and boots. 2in1 long sleeve ruched dress in slate paired with vegan gold clogs.